Am Trakt Mennonite Settlement, formerly located in the province of Samara (formerly Kuibyshev from 1935 until 1991) on the Volga River, Russia, was established by Mennonites from Prussia in 1853. When, in 1847, Prussia passed a conscription law, Claas Epp Sr. and Johann Wall were delegated to investigate settlement possibilities in Russia. The Russian government granted the application for 100 Mennonite families of Prussia to settle in Russia, under the condition that each family make a down payment of 350 talers to the Russian embassy in Berlin, which was to be repaid after settlement, deducting expenses incurred by the government in connection with it. The settlers were to be model farmers for the surrounding population, and were promised free exemption from military service for 20 years, after which time they were expected to pay taxes for the exemption. Every family received 160 acres of land. The first 22 families under the leadership of Epp and Wall left Prussia in the fall of 1853. They spent some time in the Molotschna settlement until the delegates had located the land for settlement, which was located near the Tarlyka River and its tributary, the Malyshevka, on a tract of land used as a road to haul salt (Salztrakt) with sufficient pasture land. In the fall of 1853 the first nine families, coming directly from Prussia, arrived and stayed over winter in the village of Privolynaya. In the spring they established Hahnsau. Köppental was founded in 1855. By 1880 all 10 villages had been established: Hahnsau, Köppental, Lindenau, Fresenheim, Hohendorf, Lysanderhöh, Orloff, Valuyevka, Ostenfeld, and Medemtal. * Settlers of Hahnsau moved to Central Asia in 1880-81. The settlement consisted of 37,800 acres. The settlers of Hahnsau and some of the other villages moved to Central Asia in 1880-81, under the leadership of Claas Epp Jr. The village pattern deviated somewhat from that of the Mennonite villages of the Ukraine. Because the farmers who settled here brought some money, the settlement prospered economically, although the soil was not quite as good as in the Ukraine and in spite of periods of drought. They raised primarily wheat and rye, although barley, oats, and other crops were common. Later they became expert in selecting the most suitable seeds for the territory. Studies of their achievements were made repeatedly by Russian writers even after the Revolution. Their agricultural machinery was in part imported and in part made in local Mennonite factories. Especially well known was the Epp factory of Köppental. The Mennonites also became known for their breeds of horses and cattle. Culturally the Mennonites of the Am Trakt settlement developed rapidly. They established elementary schools, and many of their youth attended secondary schools in the Ukraine. Before World War I they established a secondary school at Köppental. They had a mutual aid treasury, fire and theft insurance, as well as accident insurance. The settlement had its own administration. The two outstanding Oberschulzen, Johann D. Dyck (1866-1884) and Johann Bergmann (1884-1896), made outstanding contributions to the economic and cultural progress, achieved particularly in 1900-14. In 1908 a cheese factory was established. In 1910 an agricultural association was founded which sponsored an agricultural fair in 1913, and the educational system was improved. Five thousand additional acres were purchased for young couples. At the outbreak of World War I the young Mennonite men were drafted and served in the zemstvo organization in hospital work. The families who lost their breadwinners were remunerated by the settlement. When the Volga Autonomous Soviet Socialist Republic was organized in 1924, the Am Trakt Mennonite settlement became a part of this Republic. D. J. Klassen and J. J. Dyck represented the Mennonites for a time in the legislature. During the period of drought and starvation, the Mennonites of the settlement as well as the population in general were helped by the Mennonite Central Committee, represented by C. F. Klassen and Peter Fröse. After the hardships of the trying years, the agricultural life of the Mennonite settlement was revived during 1923-27. The Malyshevka Agricultural Association was organized in 1923, which specialized in the selection of seeds and making them available far beyond the settlement. The land of the Mennonite settlement was distributed according to the size of the family and the available agricultural machinery. The settlement took an active part in the efforts of the Allrussischer Mennonitischer Landwirtschaftlicher Verein. Johann L. Penner was the first chairman of the district council after the Revolution; he was succeeded by A. A. Fröse. The young men of military age were at this time freed from military service, after the sincerity of their religious conviction had been examined. Some Mennonites immigrated to Canada. By 1927 there was a trend toward a more radical Communist program. Around 1929 the settlement had a Mennonite population of about 2,000. Many of the Mennonite leaders were exiled at this time and later just as in the other Mennonite settlements. When Germany invaded Russia, the Volga Republic was automatically dissolved and most of the population exiled to Asiatic Russia, thus ending the Am Trakt Mennonite settlement. Am Trakt. Eine mennonitische Kolonie im mittleren Wolgagebiet. North Kildonan, 1948. Dyck, Johannes J. 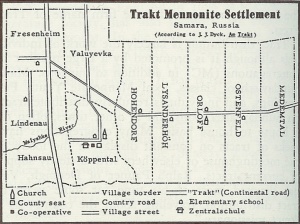 Am Trakt: a Mennonite Settlement in the Central Volga Region. Winnipeg, MB: CMBC Publications, 1995. König, Lothar. Die Deutschtumsinel an der Wolga. Dülmen, 1938. Krahn, Cornelius. "Am Trakt Mennonite Settlement (Samara Oblast, Russia)." Global Anabaptist Mennonite Encyclopedia Online. 1959. Web. 20 Apr 2019. http://gameo.org/index.php?title=Am_Trakt_Mennonite_Settlement_(Samara_Oblast,_Russia)&oldid=134983. Krahn, Cornelius. (1959). Am Trakt Mennonite Settlement (Samara Oblast, Russia). Global Anabaptist Mennonite Encyclopedia Online. Retrieved 20 April 2019, from http://gameo.org/index.php?title=Am_Trakt_Mennonite_Settlement_(Samara_Oblast,_Russia)&oldid=134983. Adapted by permission of Herald Press, Harrisonburg, Virginia, from Mennonite Encyclopedia, Vol. 4, pp. 743-744. All rights reserved. This page was last modified on 14 July 2016, at 20:58.